Five for Friday Archives | Play. Work. Repeat. This marks week FOUR of my chimney being repaired. The endless rain and thunderstorms has thwarted the quick rebuild of one of the chimneys on my house. And when it’s sunny?! Well, my guess is the contractor double-booked and just doesn’t want to say anything since they aren’t showing up here! Imagine someone with my level of impatience coming home every day to the dreaded tarp, which I now feel as though I need to name since it’s been hanging off of my house for so long. It has sent me into quite the home improvement tizzy, prompting me to take off today from work and accomplish some long-overdue to-dos off the list! ::1:: Since the chimney debacle is happening outside, I want nothing more than to add landscape lighting that will detract from the scaffolding and all around wreckage. What I don’t want to do is pay a fortune for it. 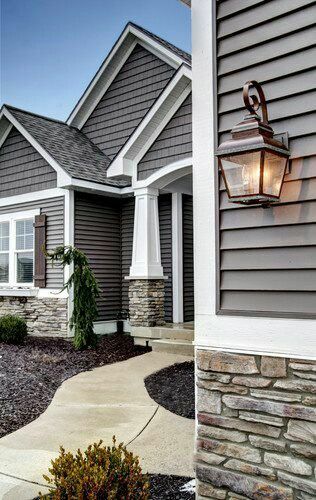 Enter this great tutorial on how to set up your exterior lighting, with a nice section for DIYers. ::2:: After the chimney is done, we also need our front steps/porch re-bricked. If it’s a total tear down anyway, I’m thinking something as sleek as this, with stone instead of brick. And lighting. Lots of lighting. ::3:: And eager to change the color of the house and its stone work to something more like this. ::4:: For the interior, still completely obsessed with turning our basement into a usable space until the time comes where we can finish it properly. This week seemed like a marathon. Corporate events, industry events and…you know, work in general…had this home body living for Friday all week long. With those seemingly impossible deadlines nearly behind me, I say a very hearty “welcome” to the weekend! ::1:: I’ll admit it, I’m a fangirl of America’s Got Talent. I first watched the show in 2016 and became instantly hooked. I absolutely cannot wait for the live shows, but am also very happy the human fountains are behind us so I can hold down my dinner on Tuesday nights again. ::2:: In other amazing television news, this BBC America gem, Killing Eve, is a must watch. The acting is stellar, the storyline is fascinating and the characters are so compelling. It will be interesting to see how the season ends! ::3:: During a sale this Summer, I bought a Beauty Bioscience GloPRO. I’m not going to lie…I was TERRIFIED this microneedling tool was going to hurt, so it sat for a couple of weeks before I (drank a lot of wine first and then) used it. I swear, it does not hurt and I feel like I’ve seen results even using it only sparingly. I wouldn’t lie — this body has ZERO threshold for pain. ::4:: Speaking of pain…why, why, why are corporate events SO PAINFUL for marketing staff?! The industry in which I work is not known for its happy employees, but the amount of complaining at an incredibly successful event was at an all-time epic level this year. Perhaps if they knew complaining was bad for your health, they would start to smile every now and again. ::5:: In practicing what I preach, writing a list of things I’m grateful for and excited about every day has been helpful in rewiring my mindset in a more positive direction. You must be so sick of me saying it, but this Panda Planner has truly been life changing. What surprised me was how hard it was — especially at first — to come up with even one thing I was grateful and/or excited for. And my life is pretty darn good, but I was so focused on trying to mitigate the negative that I wasn’t seeing the positive right in front of me. Just like an instrument or language, a positive mindset requires practice. SUMMER! It’s finally here. Hard to believe there were massive snowstorms just a few months ago with 90 degree temps on the horizon. Here are a few things that are giving me all the Summer feels. Nothing says Summer more than frozen treats. I literally could not pick just one to share, so here’s a whole board of amazing ice cream and popsicle recipes. To your taste buds, you’re welcome. To your waistline, I’m sorry!!! Along similar lines, Summer also makes me crave rosé. Loving on this La Crema go-to, and interested to see what the Saralee’s Vineyard version tastes like. Now that I’ve said “crave,” all I can think about is this book I’m reading called, “Our Kind of Cruelty.” I’m a third of the way through and it’s just…so…creepy. Summer beach read creepy. ANYWAY! In order to enjoy said ice cream and rosé, I’ve been cutting back on my calories during the day…especially lunch. (You are useless to me in non-brunch form, lunch!) So, of course, I’ve been daydreaming of eating Mexican Eggs Benedict every freaking morning. I can’t quit you, fatty foods. What better place to eat fatty foods than the movies?! Love my tub of popcorn and gallon of Coke Zero with a good movie. Just recently took wee man to see “Incredibles 2,” which was downright delightful. Would it have been easier to carry a 4 year old through the movie without the 40 minutes of trailers, animated shorts and thank you messages? Ummm…yes, but the movie was great. Summer blockbusters, FTW! Bonus: I’m all in on the “Happy Core Memory Development Program”…wait for it. I almost want to throw a dinner party so I can make this…and then eat it all myself. Obsessing over skincare lately. The Sephora Spring Sale only enabled my crazy. Every grilled cheese should look like this beauty (plus, I won’t have to throw the aforementioned dinner party). I think every office should have one of these water coolers. I’m adding it to the suggestion box. Organization goals that would likely end in a perfect #pinterestfail. Challenge accepted. Bonus: Starting to reconsider the dinner party if it means I get to eat these.